A king cake and Mardi Gras beads are absolute must-haves for a Mardi Gras party or even a small celebration with your family. 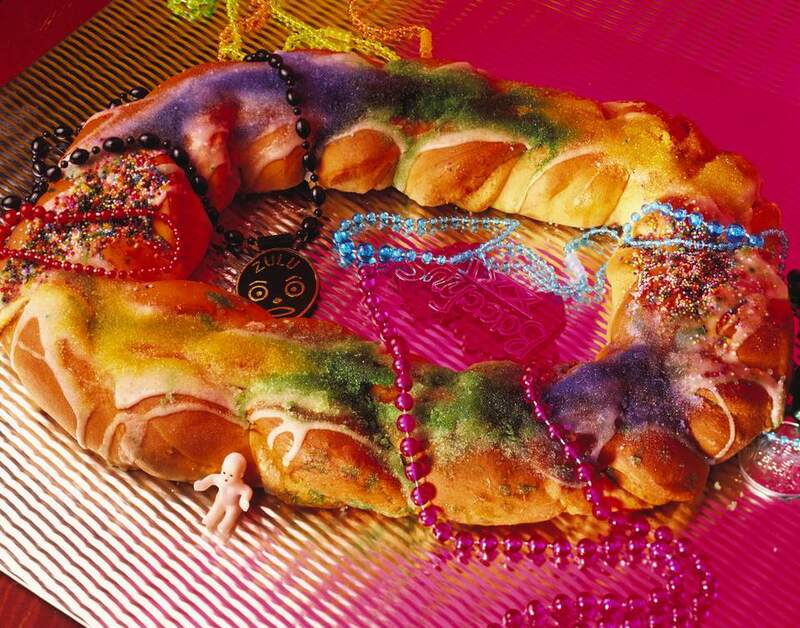 King cakes are a sensational, one-of-a-kind combination of coffee cake and French pastry, always decorated in Mardi Gras colors of purple, green, and gold. And every cake has a plastic baby hidden inside. Whoever finds it is king of the party and is tasked with having the Mardi Gras party the next year, or so the tradition goes. Whether you live in NOLA and want to have the best king cake ever or you live miles from New Orleans, there are amazing king cakes you can order online from authentic New Orleans bakeries and have shipped right to your door. Laissez Les bons temps rouler (let the good times roll), no matter where you live. The Randazzo family name is well-known in New Orleans for great king cakes, especially for filled ones.The price of a king cake from Randazzo's includes the cake, Mardi Gras beads, cup, and doubloons. You get the cake on an overnight delivery so it's as fresh as possible. And that's also included in the price. Joe Gambino's has been making mouths drool in New Orleans since the late 1940s when he bought the Beulah Ledner Bakery name and her recipe for her famous dobergecake—a delicious, multilayered confection with buttercream filling and a caramel glaze on top. Of course, being in New Orleans, Gambino's has perfected the art of scrumptious king cakes. Gambino's delivers them with overnight shipping, and each one is made fresh that day, one at a time. King Cakes has been in the business of making great king cakes and only cakes since 1999. Most bakeries only make king cakes during Mardi Gras season, but if you have a jones for a king cake in, say, July, you can get it from King Cakes. This bakery ships to all 50 states every day of the year. The package includes beads and a doubloon from a Mardi Gras parade. You can order traditional, cream cheese, chocolate, praline, strawberry (great for summer), apple, or raspberry. King Cakes ships the frosting and sugar in separate containers so the cake does not get damaged in shipping. Haydel's has been around for three generations and has world-class king cakes that come in a variety of packages. The King of Carnival Traditional package includes French Market coffee, beads, and a Mardi Gras CD, poster, and cup. At Cannata's you can order the traditional type of king cake or 60 other flavors. Some of the choices are apple cinnamon pecan, strawberry cream cheese, praline, pistachio coconut Bavarian, or salted caramel. A king cake package includes the king cake, a Mardis Gras mask, beads, Champagne cups, and king's crown. Bywater Bakery is a new entry into the king cake club in NOLA. It opened in January 2017, just in time for that year's Mardi Gras celebration. You can order the genuine article or get creative (Bywater did) with fillings like mascarpone, almond flavoring, and berries; Cajun bouille custard; apples, brown sugar and cinnamon; pralines; and Creole cheesecake.